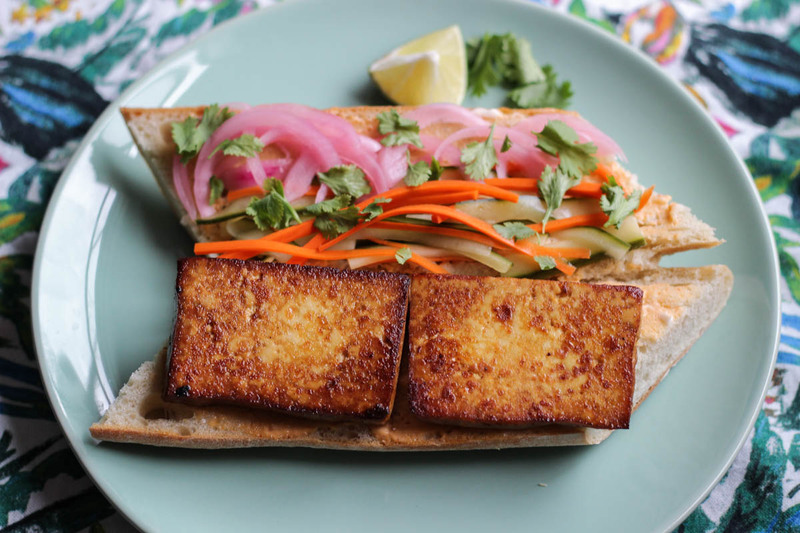 Any other tofu and pickle lovers out there?? 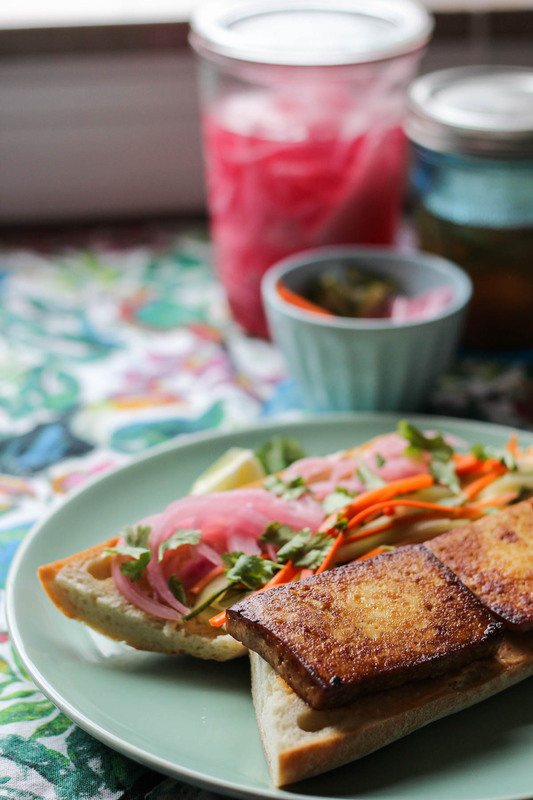 These banh mi sandos are SO tasty and meant for people like us!! Texture, flavor, it’s all here on this little baguette. 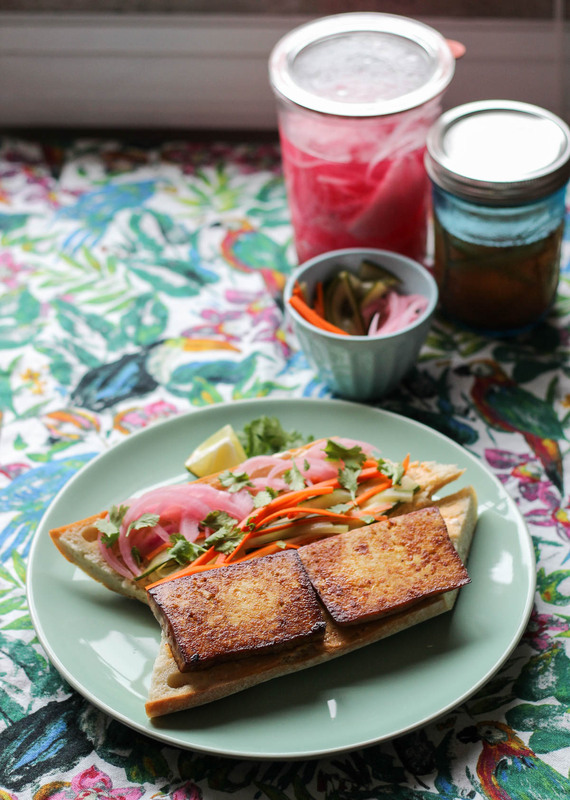 They’ve got easy homemade pickled veggies, a zingy Sriracha mayo sauce, and perfectly marinated tofu. So much goodness going on. Let me start off by saying when you scroll down to the recipe section, don’t be alarmed. These do take a bit of extra love. BUT but but, most of it can be prepped ahead of time! 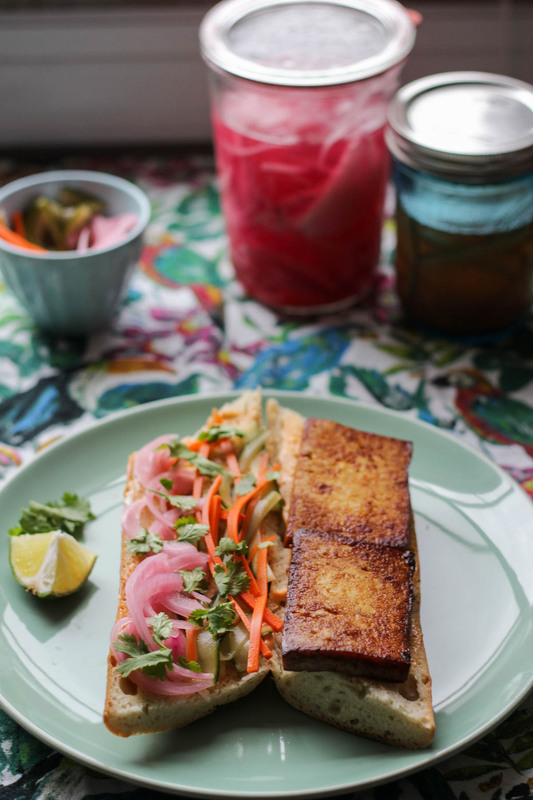 You can make the pickles multiple days beforehand, and same with marinated the tofu! So really it’s just a super easy sando assembly. Ten minutes, tops. 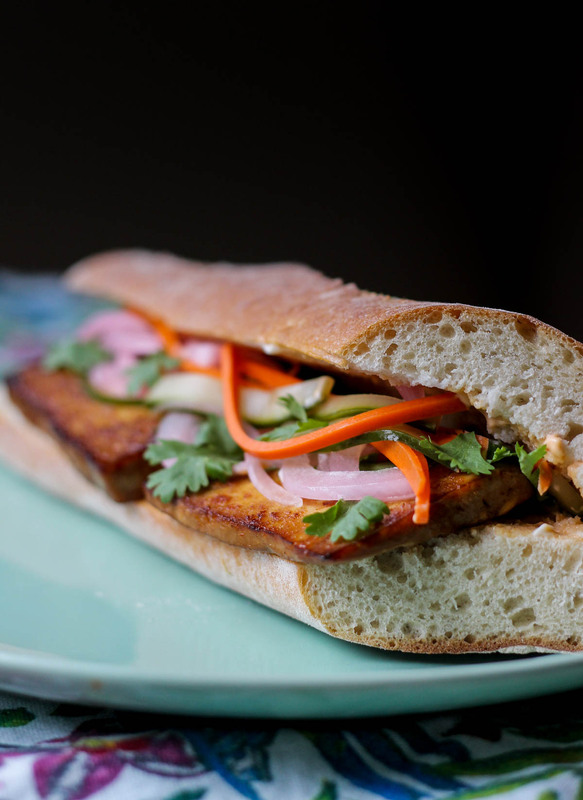 When I was in Vietnam briefly this year, I sought out a vegetarian banh mi in Hanoi. 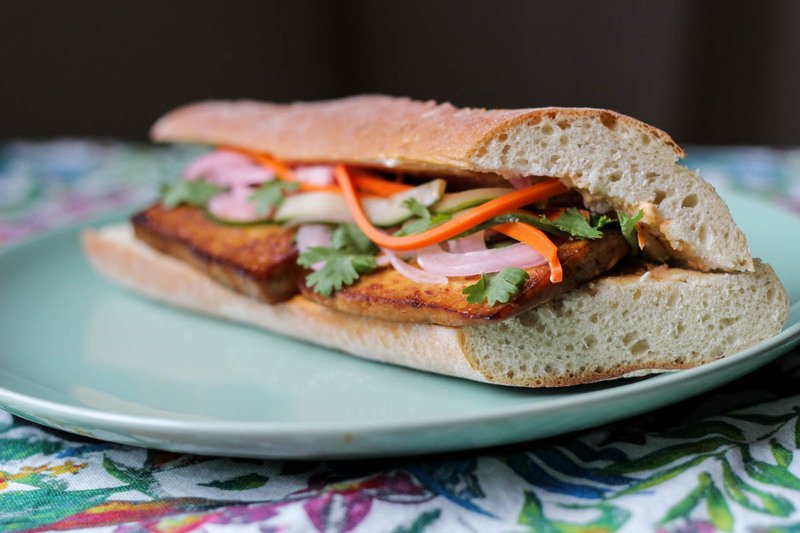 It was one of the quintessential Vietnamese dishes I wanted to try because they’re one of my favorite sandwiches. Honestly, I was a little disappointed. 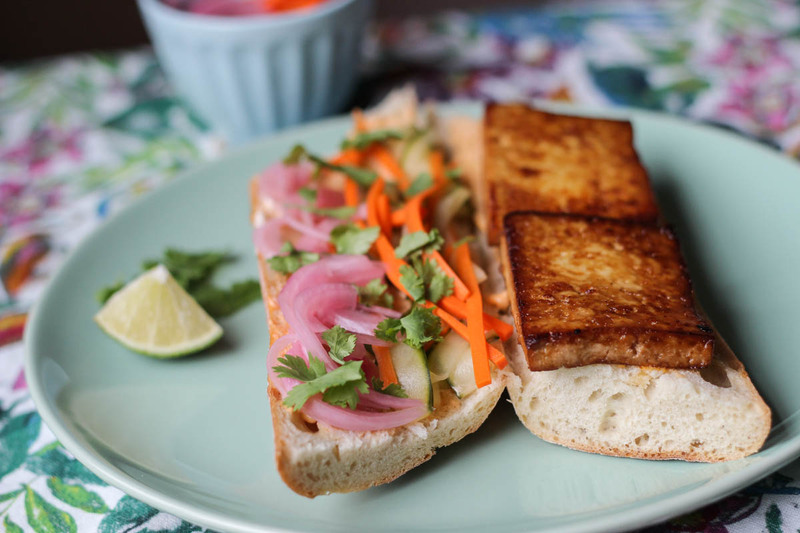 Maybe it was the place we went to (although it had good reviews and was well known), but I’ve had much better banh mi in San Francisco. Anywho, it made me want to make them myself since they’re so easy! 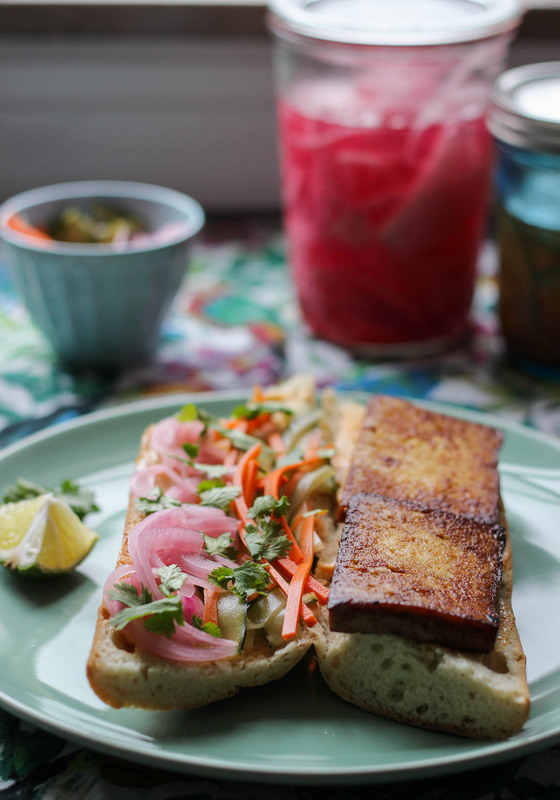 Vietnamese inspired: Pickled veggies, zingy Sriracha mayo & marinated tofu sando on a baguette. Pickled Veggies: Cut your veggies into matchstick sizes. 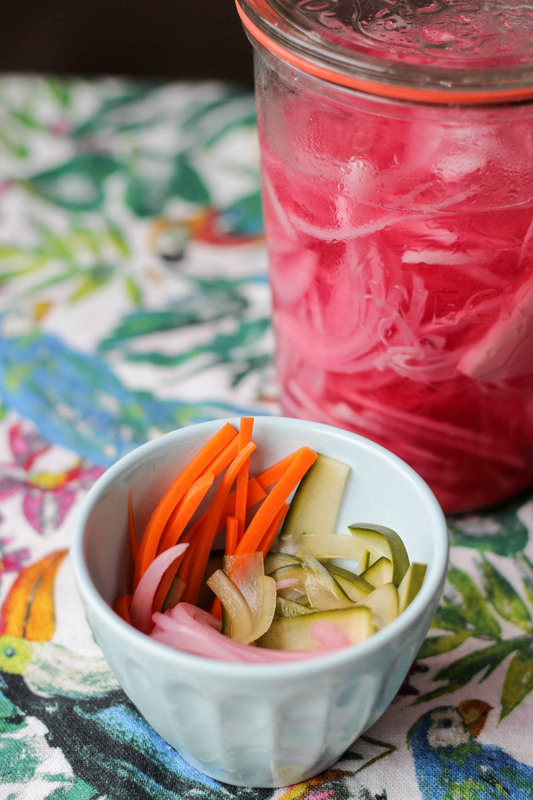 Combine the liquids in a jar and add your veggies. Allow to sit at least an hour, or store in the refrigerator until use. Tofu: Press the tofu between paper towels with a heavy object on top for at least half an hour. Slice into thin blocks to serve on the sandwiches. 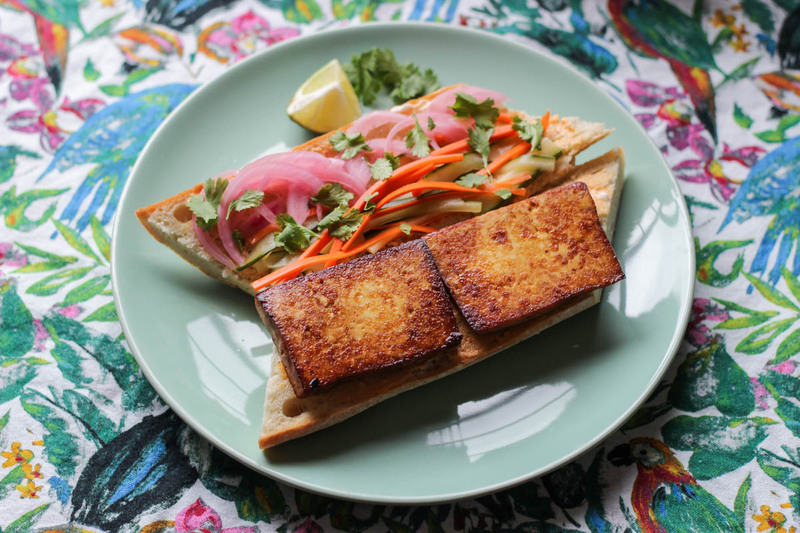 Combine your marinade ingredients in a bowl and add the tofu. Allow to marinate at least an hour, or overnight. 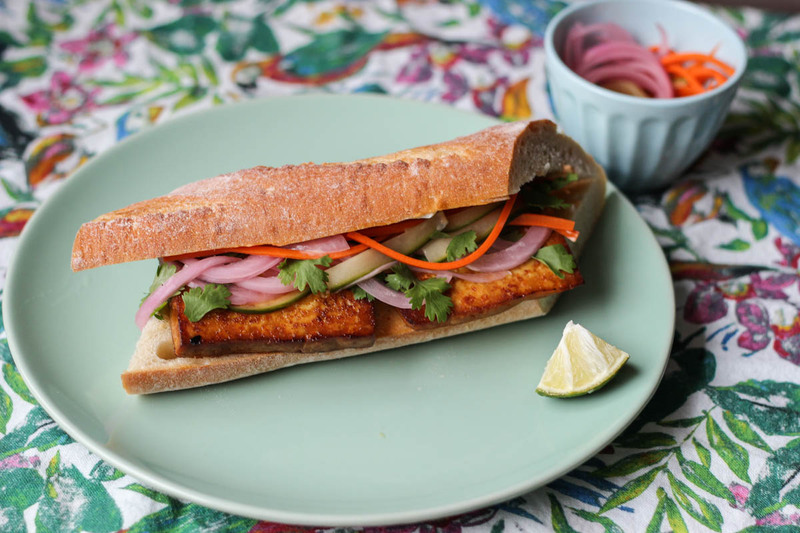 When serving, sear two pieces per sandwich in a hot frying pan until crispy on both sides. Assembly: Whisk together the mayo ingredients. Apply to both sides of your baguettes. 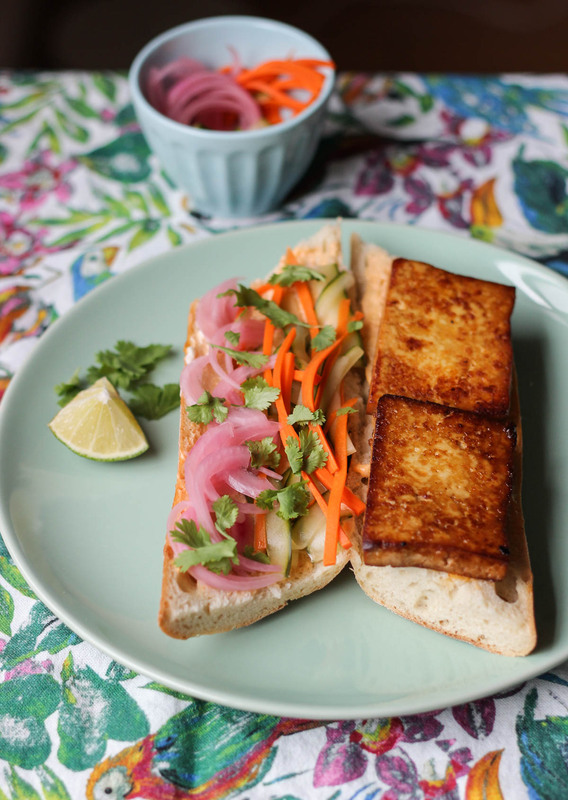 Next arrange the tofu, veggies and cilantro as desired. Serve with lime wedges. 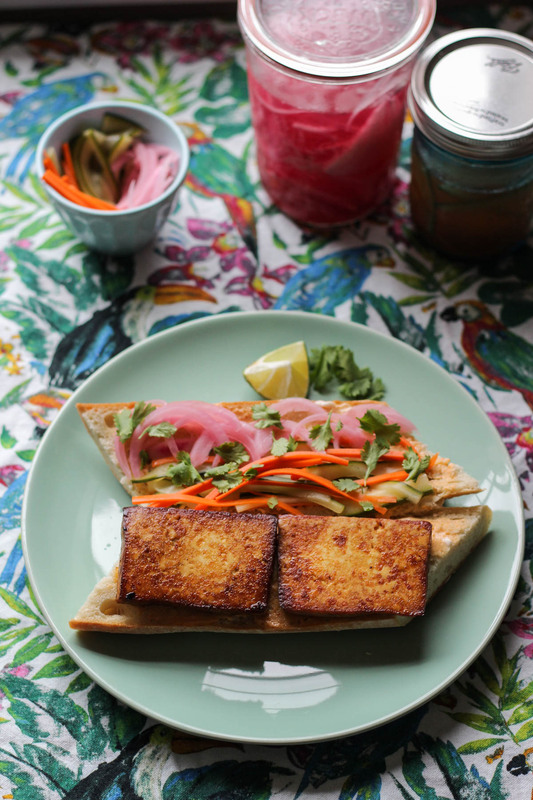 Definitely prep your pickled veggies and tofu first thing if you want to eat these the same day! Holy sandwich of flavor & crunch. There’s so much texture going on, and I just love everything about these. We made these two days ago, and then made them again tonight because they’re so darn good.